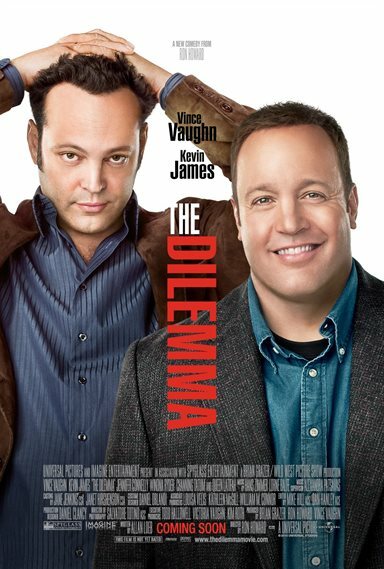 The Dilemma is a film about two friends, one of whom happens to over see the others wife cheating with another man. Now he is caught between doing the right thing for his friend and ruining his life at the same time. Kevin James and Vince Vaughn star as Nick Brannen and Ronny Valentine, two best friends who not only do everything together but also work with each other as well. The two gentlemen are married, Vaughn is married to Beth (Jennifer Connelly) and Geneva (Winona Ryder) is married James. Naturally being that Ronny and Nick are best friends the four of them spend a lot of time together. One day Ronny spies his best friends wife cheating with another man. As it happens he stumbles into a patch of garden that is quite poisonous. Now not only does Ronny face the issue of telling his best friend that his wife is cheating on him but also he must endure the difficult recuperation after his accident. Of course this leads to some awkward situations as he attempts to try and explain to his friend what he saw but can't seem to work up he courage to do it. The movie seems to jump back and forth from a traditional slapstick comedy, dark humor and light drama when it comes to discussing the nature of relationships. During scenes such as when Ronny first catches Geneva in the act the movie employs slapstick comedy as he stumbles through the garden. Then later when he is trying to figure out how to handle telling his friend he ends up arguing with Nick about work and suddenly the audience is in the middle of a heated drama. The result from this back and forth is an un-even tone for the movie which ends up turning you off to the movie altogether. Vince Vaughn is a funny actor and can certainly do drama if he wanted but for some reason he keeps winding up in these movies where he is constantly switching between genre's. There have been some movies of his where this blend worked, like Wedding Crashes and others where it didn't like The Break-Up; the difference with Wedding Crashers is that it only dropped in those dramatic moments momentarily and then immediately returned to comedy. Overall the performances in The Dilemma feel very forced regardless of what scene and/or tone it is in. Ron Howard who has shown in the past that he can do a blend of drama and comedy directs the movie; Parenthood is an excellent example where that blend succeeded. Lately his movies have been hit or miss, The DaVinci Code, and Angels & Demons are good examples of his success. It doesn't help that this movie is billed as a comedy and even watching the trailer that's what you are led to believe. Unfortunately with the uneven pacing, lackluster performances and lack of humor The Dilemma becomes less of a comedy and more of a disappointment. Download The Dilemma from the iTunes Store in Digial HD. For more information about The Dilemma visit the FlickDirect Movie Database.